The original Breadwinner is on the right. Note the different headstock and the different bridge on the one to the left. I'm betting dollars to donuts that Eastwood Guitars will put out a Breadwinner clone. Re: Big News for Ovation Breadwinner Fans?! I e-mailed Mike Robinson of Eastwood/My Rare Guitars, and true to form, Mike e-mailed me back. The pic is of the only prototype they've made, which he said turned out "perfect." Should be in production in 2009. Is he making more like the guitar on the right? I like the headstock. I also noticed the control knobs are bigger and the 1/4" jack is located in the rear. Looks like you take good care of your gear. What year is the original? The one on the right is the original made by Ovation, and long out of production. The new ones are clones with some differences, such as the ones you pointed out. This will be the second Ovation solidbody clone that Eastwood has made. 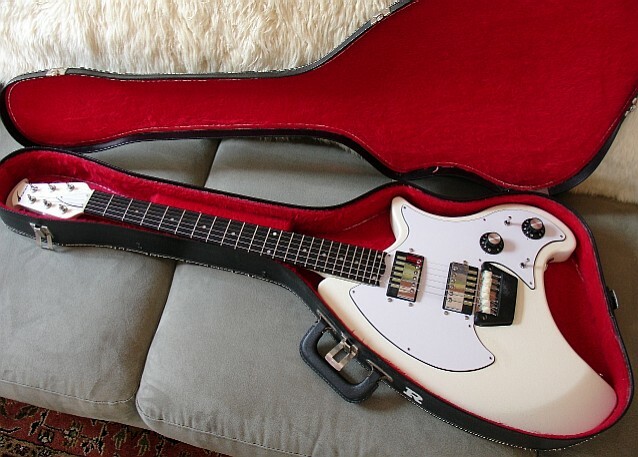 They also made a clone of the old Ovation GP, which is the guitar Josh Homme plays. The GP is a much more rare Ovation solidbody (only 250-1000 made). The My Rare Guitars site doesn't have a date on the white Ovation they're selling, but going by the pickups (those are big single coils, they later changed to humbuckers similar to the mini's in the Eastwood clone) it should be aabout the same age as mine, around 1973. It would be cool if more companies invested in bringing back long gone models or creating some new ones. I have nothing against the "classics" but I'd love to see some new stuff. WOW. I wish I could come across a "classic" axe for a good deal like that one! I'd probably incase it in glass and it would just be a decoration though. Naw, ya gots ta play 'em! In fact I haven't played mine nearly enough though, just recently got some minor issues fixed so Ol' Blue is ready to go. Sweet man. Someone once asked me if I won the lottery and bought a 67 Shelby 'stang would I drive it, I said "till the wheels fall off." I guess guitars ain't much different huh? You got it! I played Blue at my first-ever gig (an apartment-complex party) in 1980, and then as my main guitar for the next 10 years, first in a bunch of "party bands" made up of friends and then my first "serious band" that did originals and played in clubs.